Great Comforter Sets at Great Prices. Looking for a comforter set? 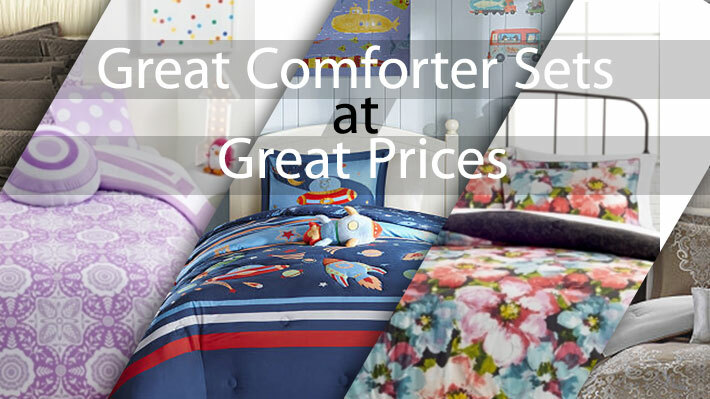 Here’s a list of select comforter sets from the best of the brands at unbelievable discounts. Check out the GeoQpons website to get coupon codes and enjoy the discount. This four piece twin comforter set from IdeaNuova in deliciously lavender will add a sweet charm to any room. Pretty and soothing, the gorgeous comforter can be used back sides with a geometric pattern in lavender and white. Madison Park Belle 7 piece Comforter Set. Earthy colors and a fine embroidery pattern make this Belle comforter a style statement that will add luxury to your room. The comforter set consists of 7 pieces adding to the luxurious feel. Get the comforter set from JCPenny at an amazing discount. A beautiful combination of classic elegance and modern allure. The simple yet stylish pinstripe tucks along in subtle sheen make the comforter set even more tasteful. Available for king sized and queen sized beds. Get stunning discounts from JCPenny for this Madison Park Channing Pleated 6 piece Duvet Cover Set. Mi Zone Kids Space Ranger Comforter Set. Add excitement to your kid’s room with this fun comforter set with spaceships and rockets. Get a fun rocket shaped pillow your kid will love. The three piece set includes: sham, comforter and decorative pillow. Four piece includes 2 shams, decorative pillow and comforter. Closeout! Camille 3 Piece Double/Queen + Full/Queen Comforter Set Bedding. Artistic and stylish, this tastefully colorful comforter set will add beauty and art to the room. Three piece comforter set includes a Camille comforter with two shams. Get a great deal for the Camille comforter set from Macy’s. Get luxury at an unbelievable discount. A soft tone of brown with a shy sheen and the ivory design brings opulence and elegance to the room. The seven piece comforter set includes a bed skirt with 15” drop, one comforter, two shamsand three decorative pillows. Enjoy the benefit of no wrinkle bedding. The 100% cotton sateen with extremely soft 400 thread count and polyester fill make this bedding soft and comfortable, atreat to sleep in. Shams, comforter, decorative pillows, bed sheet and bedskirt, all sold separately. Luxury and elegance personified. A fine blend of soft color tones on a special soft chenille fabric make this luxurious comforter set even more splendid. The 4 piece bedding set includes one comforter, two shams and one bedskirt. Matching accessories sold sepeately. The richness of lavish brown combined with floral design in ivory white makes this Madison Park Marie Scroll Comforter set give a very warm and inviting look to the bedroom. The seven piece comforter set includes 2 shams, comforter, bed skirt with 15” drop and three decorative pillows. Available in queen and king sizes. Sprinkle a bit of spring in your bedroom any time of the year!Bold floral watercolor design with a dash of color on white makes this comforter set creative and inviting. Four piece comforter set includes one comforter, sham and 2 decorative pillows and the 5 piece includes comforter, 2 shams and 2 decorative pillows. Modern and chic, the chequered comforter set is sure to add a touch of class to your bed room. Get a comforter, 2 shams and a decorative pillow. Available in queen and king sizes too. Refreshingly fashionable. Get zebra stripes on one side an dleopard spots on the other in a cool green and teal combination. The 5 piece set includes one comforter, 2 shams and 2 decorative pillows.